Synagogues have long been the hub of local Jewish communities, but what that looks like for a successful, dynamic, sustainable synagogue today may be quite different than what we’ve previously known. Today, synagogue membership is down, and research on millennials shows that this younger generation has even less trust and commitment to institutions than Gen Xers. We are at a moment where synagogues are recognizing that continuing to swim upstream perhaps isn’t the best approach. While change is difficult and the destination not totally known yet, we do know that not changing may in fact be riskier than staying the same. So if we’re ready to change, what does that look like? Connected Congregations is an effort to explore the attributes of the 21st century synagogue, and the process needed to realign our congregations to thrive in today’s connected landscape. If we are to build strong and sustainable synagogues, we need to understand the building blocks to get there. We believe that individual relationships are the fundamental unit or building block of community. And a strong and well connected community is necessary to have a strong and vibrant congregation. And that congregation is necessary to have a sustainable synagogue as an organization. Thus, we need to design for relationships and build up from there. Our vision of a “Connected Congregation” is one that deeply understands the meaning of community, and works explicitly to build a strong, meaningful and engaged Jewish community. Connected Congregations prioritize relationships and shared values as the foundation of a successful synagogue, and align all aspects of institutional management in service of this community. Those who are part of connected congregations feel a sense of shared ownership and responsibility for each other and the collective, and are empowered to contribute their ideas, energy and resources. 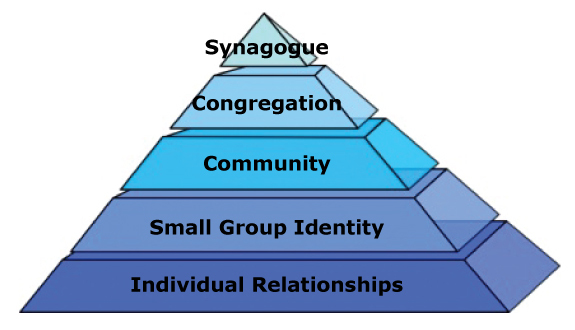 While this vision may sound familiar, we have found that many aspects of synagogue life—from dues models and governance, to program design and measurement, to communications design and staffing models – in fact retard community building and reinforce the ‘transactional Judaism’ that we know isn’t, for the most part, working. Connected Congregations is an effort to learn, experiment and evolve together. By pursing multiple paths to this vision of a connected and purposeful community, we hope that all synagogue leaders will find inspiration, resources and support to innovate and become more connected. Have a question, or a practice or insight to share? Please be in touch!